NOTORIOUS: A Biggie Smalls-inspired panda portrait looms over the crowd at Double Dragon. 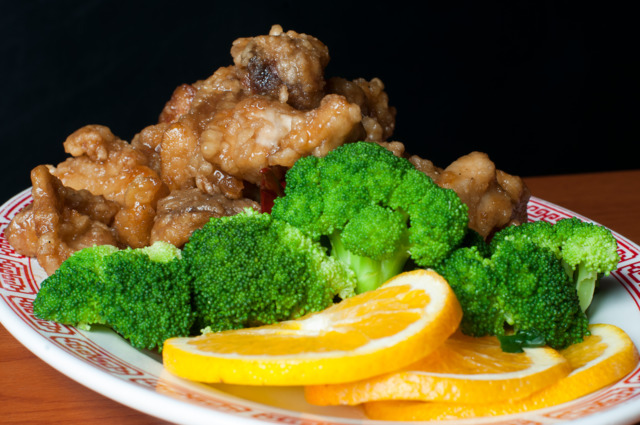 Sticky sweet General Tso's chicken, deep-fried and smothered in shockingly bright red sauce, is what many Americans associate with Chinese food. Purists claim it is "not authentic," but a gluttonization of Chinese culture. Historically though, it is real Chinese food. What we know as this cuisine came by the way of Chinese immigrants during the Gold Rush, with food made to satisfy cravings using vegetables not raised or used in China. This cookery has an identity of its own and serves as an example of the Chinese ability to adapt and innovate. Oakhurst's Double Dragon is both an homage to and a reminiscence of this Chinese-American style. Second-generation Chinese-American restaurateurs Michael Lo and George Yu, also of Taiyo Ramen (formerly Makan) and Suzy Siu's Baos, relished the chance to reproduce the type of restaurant they grew up in, but with high quality and locally sourced ingredients. The name is intentionally kitschy, harkening back to the names of classic Chinese spots in the '80s and their favorite beat 'em up arcade game of the time. In fact, the pair plan to eventually install a classic arcade-style console in the restaurant, but with a modern-day emulator stocked with 3,000+ games. So, here's how the scene goes, arcade-style. It's Friday evening. The search is on for side street parking. Near the door are adversaries (lots of families with lots of screaming kids). We race to the hostess armed with weapons ... er, iPhones. Wait time is 30 minutes. Kids battle in the lot with branches. A dad sniffs his toddler's bum and makes his way to the restroom. No gangs with weapons, but there sure are a hell of a lot of kids. Our street battle is over and we walk past tall black booths with red leaf-embossed hanging drum-shaped lamps. Silver haired women fan their mouths as they exit. The boisterous, L-shaped bar is full with a dozen or so diners. Kung fu plays on the TV behind the bar and the walls are lined with pop art by local artist/bartender Janice Rago: a Biggie Smalls inspired panda wearing a crown, Bruce Lee in a laced-up '70s shirt. BIG BOSS: '70s-era Bruce Lee looks on as a server walks by. There are lots of choices to start out a meal snacks, dumplings and soups. Mildly spicy Sichuan boiled peanuts come heaped in a bowl. Dumplings (pork or chicken) are stuffed full, crisp and browned on one side. Tiny won ton purses swim in poached garlic chili oil topped with chives. They are a soft chew; edges with a light crunch, and natural flavors of pork and shrimp coming through. Eggrolls are large and thick-skinned with a blistered crust, chock full of ground pork and veggies. Soups are familiar: wonton, egg drop, hot and sour. What is remarkable is the hot and sour. It's luscious, thick and meaty with strips of bamboo shoots, abundant mushrooms and bits of Pine Street bacon. As we choose from the Sichuan items, our outgoing server asks if we are familiar with that fiery Sichuan heat. (Remember the fanning ladies?) We are, and try for the whitefish but it is sold out. Spicy sweetbreads are scorching and rich. The large portion seems poached then braised, with zero gaminess and the wonderful numbing tingle of Sichuan peppers. Most entrees stick to the aforementioned Americanized Chinese classics but a few are truer versions of traditional dishes, like lobster Cantonese and clams with black bean sauce. Moo shu pork seemed to be popular. Diners at every table were filling thin pancakes with the sweet mixture of pork, eggs, mushrooms and onions and slathering thick hoisin on top. Vegetable chow mein is more vegetables than noodles with crunchy slivers of celery, sprouts, julienned carrot, onion and bamboo shoots bound together in a thick sauce. Mongolian beef and Mongolian chicken ate much like intended: fresher, healthier versions of take-out classics. The tender flat iron comes from Brasstown beef. The hoisin and soy brown sauce of the chicken version, mixed with lots of chilies, hugs the dark meat's nooks and crannies with a lingering ginger intensity. About the General Tso's the tender dark meat chunks, battered and fried using brown sugar and honey instead of cornstarch, get their light red coloring from beet juice instead of traditional food coloring. The result is craggy and crunchy; saucy but not spicy; very sweet and gingery. The chicken is rich and sits next to crisp broccoli and slices of orange. Service was flawless. The only thing I wondered about was, with all the talk of "family style," why don't dishes come with serving spoons? The drink game is also strong at Double Dragon (though the bar is not a place I'd want to linger, due to its proximity to the Oakhurst Dairy Bar, where yet more throngs of kiddos scream for ice cream). For the undeterred, there are lots of locals on draft and a full range of beers in bottles and cans. Cocktails are a mix with lots of tiki-inspired options. Traditional Asian Medicine is a riff on a Penicillin that cures whatever ails. Japanese whisky, lemon, honey and ginger meld in a warm, soothing mix with a heady topper of peaty Laphroaig. Chinatown cold tea for two served in a teapot with tiny teacups is both subtle and sweet with bourbon, black tea, grapefruit and herbal aperitifs. Much like a symbolic dragon, Americanized Chinese food is a totem to Chinese culture here in the US. Double Dragon embodies the concept, delivering a comforting blend of those homey sweet and saucy flavors, but made exclusively with local and seasonal produce and sustainable meats. Plus, slick and modern style to boot. Fortune cookie says, "Higher price worth it for families with children." 350 Mead Rd., Decatur. 404-832-0018. www.doubledragonoakhurst.com.